This was an almost surreal Father’s Day for my family. For years, we have been working at the Birthday Bash. This year was different. I had retired. It seemed strange to be home. To not have to be anywhere. No obligations. I must admit, however, that I enjoyed it immensely. I love my listeners, but this gave us our first look at post retirement life. Instead of waking up at 2:30 am to be at the grounds by 4:00 am, I rolled out of bed at 6:30 without a care in the world. It was a low key day. Nice n’ easy. A few chores around the house, a few circles around the lake on the boat and some grilled Rib-eyes. Couldn’t have been nicer. The kids came over, and we had some laughs. Then, the big reveal. 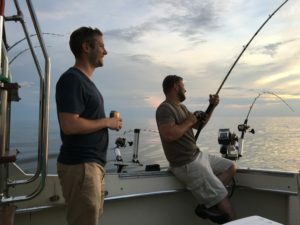 Our wives had all gone in together to buy us a Lake Michigan Charter Fishing trip! How many guys are this fortunate? My wife and our daughter’s in law had this all planned out. It was a great surprise and gave us all something special to look forward to. The day finally arrived. 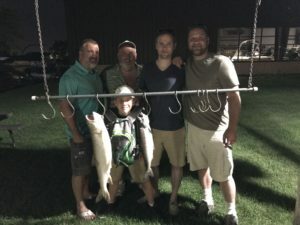 My sons and I are all into fishing & hunting. 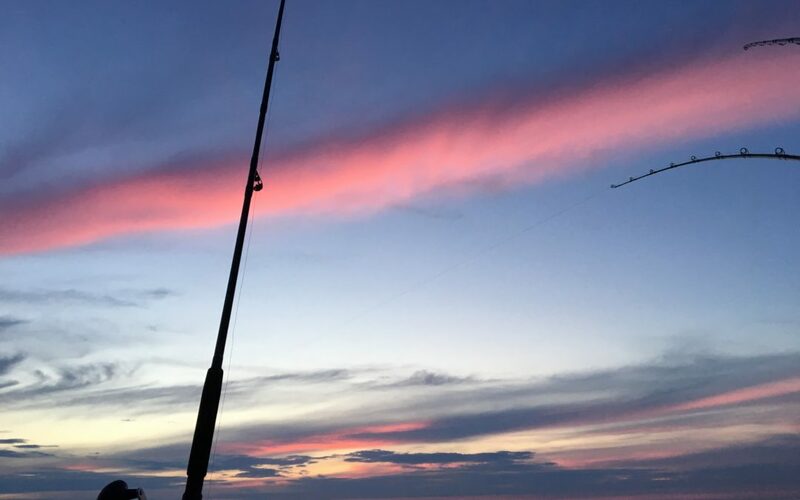 We are all quite happy fishing here for Bass, Perch, Blue gills and anything else that bites a hook. This, however, was going to be special. I have a dear friend named George who does fishing charters out of Milwaukee. He used to play guitar in (Blast from the past) Conway Twitty’s band. He often hosts big time stars out on the lake, and I’ve had the privilege to go many times, so I know how this works. Roger asked me “Do you know how this works?” I said, “Yes, We yuk it up, drink beer and YOU work!” He laughed and said, “Yeah, I guess that’s pretty much it.” My son Jeff and his son Ethan Climbed aboard. My Boy’s Christopher & Nick followed, and we got ready to head out to big water. Nick had taken it upon himself to make us some big honking sub sandwiches. I am ruined forever. Best sub I’ve ever had in my life. It was a gorgeous day. Sunny & pleasant. The lake was like glass which is unusual if you’ve spent any time on Lake Michigan at all. The beauty of the water and horizon meeting was so tranquil that it looked fake. Finally, as dusk approached the action got hot. We had a marvelous time and our hosts couldn’t have been nicer or more accommodating. Time to head in, but we were treated to a breathtaking starlit sky. 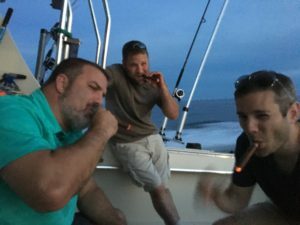 As we made the about-face from 7 miles out and 200 feet of water, Nick handed out Cuban Montecristo #2’s. (A Father’s Day gift from a well traveled business associate.) We enjoyed them all the way in and had a great memory we can cherish. As we came into port, the beautiful fountains were engulfed in magnificent color, choreographed to the music that was playing. Another special memory. As a father, my greatest joy is watching my sons together. They are not above kidding each other, but there is a mutual respect there which is hard to ignore. It is so rewarding to watch the interaction between my sons and witness the true affection these wonderful young men have for each other. I couldn’t be more proud or more blessed. Finally, Ladies thank you for a beautiful experience that will last forever. We love you!